We just know you won't want to miss the new movie Pitch Perfect (in select theaters September 28, everywhere October 5). In Pitch Perfect, Beca (Anna Kendrick) arrives at her new college only to find that she doesn't fit in. Somehow, she ends up in an eclectic group of girls: mean girls, sweet girls and weird girls whose only thing in common is how good they sound when they sing together. If you're a music fan of any kind, you'll love the new movie Pitch Perfect. Full of new acapella mash-ups and hilarious scenes, you'll be sure to find yourself laughing and downloading the soundtrack. 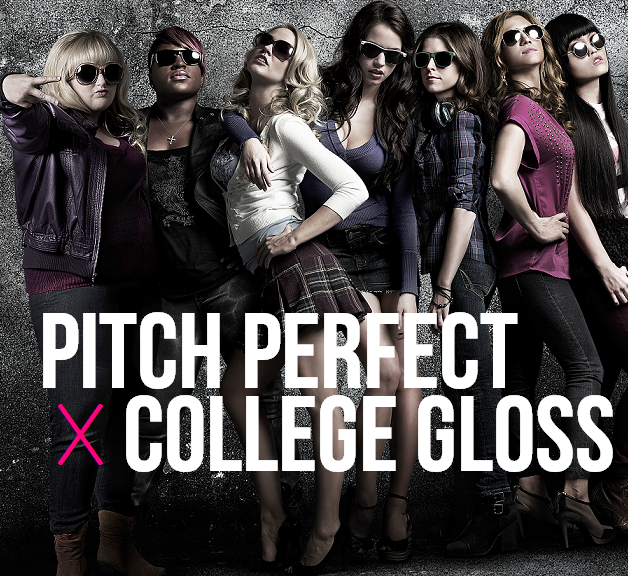 Luckily for you, College Gloss is teaming up with Pitch Perfect to give away a Pitch Perfect movie prize pack to one of our readers! One (1) winner will receive: Pitch Perfect Official Soundtrack (CD) $25 Fandango Bucks Pitch Perfect T-Shirt Aca-Awesome Magnetic Poetry Plus Sunglasses, Ear Buds and more! To enter, all you need to do is "like" our Facebook page and comment with your name and email. Pitch Perfect is in theaters September 28, everywhere October 5! Until then, like Pitch Perfect on Facebook and visit the official site at PitchPerfectMovie.com. I don't know if the contest has ended yet, but I would love to win! I can't wait to see this movie!